Why though are we not moving mountains with our faith? Why do we still encounter impossibilities? Jesus said the reason is simply DOUBT & UNBELIEVE. An unbelieving believer? When faith seems to be feeble, unproductive and not working, the problem is not the absence of faith. It is rather the presence of doubt. Though we may be strong Christians, we all have levels of doubt that contents against our faith. 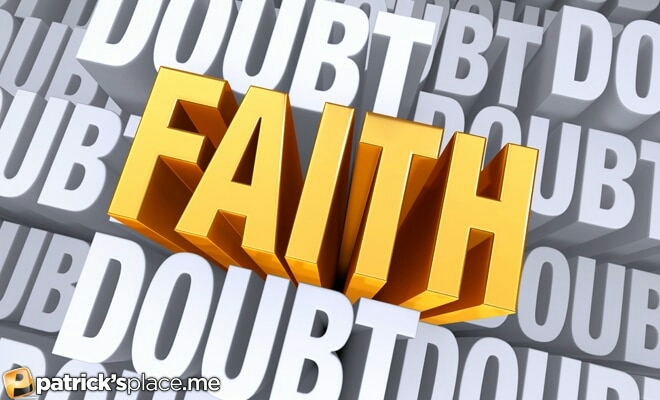 It may not be very easy for faith to block out doubt completely no matter how hard we try, but our faith can still thrive enough in the presence of doubt for us to become “more than conquerors through Him who loved us” Rom 8:37. The Bible tells us to “fight the good fight of the faith” 1 Tim 6:12. We need to always look beyond the moment in times of trials and difficulties and then try and focus on the ultimate outcome such as God has promised us. It will surely bring about a faith boost. After all the Bible says that we should all know that God uses every situation( including challenges) to work together for the good of those who love Him(Rom 8:28). After their meeting ran late, five out‐of‐town salesmen hurried as fast as they could to catch their train. As they raced through the terminal, one inadvertently kicked over a slender table on which rested a basket of apples. It belonged to a ten‐year‐old blind boy who was selling apples to pay for his books and clothes for school. The salesmen clambered aboard the train, but one felt compassion for the boy. He asked his friends to call his wife and tell her he would be late getting home. We are most like Christ when we show compassion and generosity to others. Jesus said, “Whatever you did for one of the least of these brothers of mine, you did for me” (Matthew 25:40). We reflect His character whether we’re helping someone less fortunate or giving our mate a back rub at the end of the day. How do our interactions with others reflect the character of Jesus? When was the last time we stopped to help another person in need? How do you feel when you show compassion to someone else? Lord, we ask that Your extravagant love would flow through us each day to touch those around us. Show us how to serve, to help, and to give without expecting anything in return. Amen. Illustration from The Signature of Jesus by Brennan Manning (Sisters, Ore.: Multnomah Books, 1992). Reprinted in Stories for a Man’s Heart, comp. Al and Alice Gray (Sisters, Ore.: Multnomah Publishers, Inc., 1999).